In 1859, when Charles Darwin's On the Origin of Species was first published, the fossil record was poorly known. Darwin described the perceived lack of transitional fossils as, "... the most obvious and gravest objection which can be urged against my theory," but explained it by relating it to the extreme imperfection of the geological record. He noted the limited collections available at that time, but described the available information as showing patterns that followed from his theory of descent with modification through natural selection. 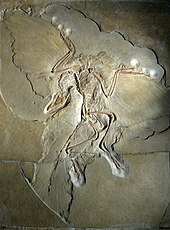 Indeed, Archaeopteryx was discovered just two years later, in 1861, and represents a classic transitional form between earlier, non-avian dinosaurs and birds. Many more transitional fossils have been discovered since then, and there is now abundant evidence of how all classes of vertebrates are related, including many transitional fossils. Specific examples of class-level transitions are: tetrapods and fish, birds and dinosaurs, and mammals and "mammal-like reptiles". The cetaceans (whales, dolphins and porpoises) are marine mammal descendants of land mammals. The pakicetids are an extinct family of hoofed mammals that are the earliest whales, whose closest sister group is Indohyus from family Raoellidae. They lived in the Early Eocene, around 53 million years ago. Their fossils were first discovered in North Pakistan in 1979, at a river not far from the shores of the former Tethys Sea. [page needed] Pakicetids could hear under water, using enhanced bone conduction, rather than depending on tympanic membranes like most land mammals. This arrangement does not give directional hearing under water. Had the Solnhofen quarries been commissioned—by august command—to turn out a strange being à la Darwin—it could not have executed the behest more handsomely—than in the Archaeopteryx. The human pedigree back to amoeba shown as a reinterpreted chain of being with living and fossil animals. From G. Avery's critique of Ernst Haeckel, 1873. Sudden jumps with apparent gaps in the fossil record have been used as evidence for punctuated equilibrium. 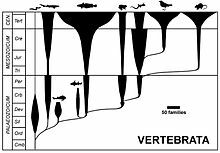 Such jumps can be explained either by macromutation or simply by relatively rapid episodes of gradual evolution by natural selection, since a period of say 10,000 years barely registers in the fossil record. ^ a b c Prothero, Donald R. (1 March 2008). "Evolution: What missing link?". New Scientist. 197 (2645): 35–41. doi:10.1016/s0262-4079(08)60548-5. ISSN 0262-4079. Retrieved 13 May 2015. ^ Prothero 2007, p. 84. ^ a b Kazlev, M. Alan. "Amphibians, Systematics, and Cladistics". 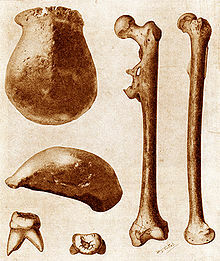 Palaeos. Retrieved 9 May 2012. ^ Prothero 2007, p. 127. ^ Prothero 2007, p. 263. ^ Prothero, Donald R.; Lazarus, David B. (June 1980). "Planktonic Microfossils and the Recognition of Ancestors". Systematic Biology. 29 (2): 119–129. doi:10.1093/sysbio/29.2.119. ISSN 1063-5157. ^ Xing Xu; Hailu You; Kai Du; Fenglu Han (28 July 2011). "An Archaeopteryx-like theropod from China and the origin of Avialae". Nature. 475 (7357): 465–470. doi:10.1038/nature10288. ISSN 0028-0836. PMID 21796204. ^ Erickson, Gregory M.; Rauhut, Oliver W. M.; Zhonghe Zhou; et al. (9 October 2009). "Was Dinosaurian Physiology Inherited by Birds? Reconciling Slow Growth in Archaeopteryx". PLOS ONE. 4 (10): e7390. Bibcode:2009PLoSO...4.7390E. doi:10.1371/journal.pone.0007390. ISSN 1545-7885. PMC 2756958. PMID 19816582. ^ Yalden, Derek W. (September 1984). "What size was Archaeopteryx?". Zoological Journal of the Linnean Society. 82 (1–2): 177–188. doi:10.1111/j.1096-3642.1984.tb00541.x. ISSN 0024-4082. ^ "Archaeopteryx: An Early Bird". University of California Museum of Paleontology. Berkeley, CA: University of California, Berkeley. Retrieved 18 October 2006. ^ a b Lovejoy, C. Owen (November 1988). "Evolution of Human walking" (PDF). Scientific American. 259 (5): 82–89. Bibcode:1988SciAm.259e.118L. doi:10.1038/scientificamerican1188-118. ISSN 0036-8733. PMID 3212438. ^ "Australopithecus afarensis". Human Evolution. Washington, D.C.: Smithsonian Institution's Human Origins Program. Retrieved 15 May 2015. ^ White, Tim D.; Suwa, Gen; Simpson, Scott; Asfaw, Berhane (January 2000). "Jaws and teeth of Australopithecus afarensis from Maka, Middle Awash, Ethiopia". American Journal of Physical Anthropology. 111 (1): 45–68. doi:10.1002/(SICI)1096-8644(200001)111:1<45::AID-AJPA4>3.0.CO;2-I. ISSN 0002-9483. PMID 10618588. ^ Northeastern Ohio Universities Colleges of Medicine and Pharmacy (21 December 2007). "Whales Descended From Tiny Deer-like Ancestors". Science Daily. Rockville, MD: ScienceDaily, LLC. Retrieved 15 May 2015. ^ Nummela, Sirpa; Thewissen, J. G. M.; Bajpai, Sunil; et al. (12 August 2004). "Eocene evolution of whale hearing". Nature. 430 (7001): 776–778. Bibcode:2004Natur.430..776N. doi:10.1038/nature02720. ISSN 0028-0836. PMID 15306808. ^ Thewissen, J. G. M.; Williams, Ellen M.; Roe, Lois J.; et al. (20 September 2001). "Skeletons of terrestrial cetaceans and the relationship of whales to artiodactyls". Nature. 413 (6853): 277–281. doi:10.1038/35095005. ISSN 0028-0836. PMID 11565023. ^ a b c Thewissen, J. G. M.; Williams, Ellen M. (November 2002). "The Early Radiations of Cetacea (Mammalia): Evolutionary Pattern and Developmental Correlations". Annual Review of Ecology and Systematics. 33: 73–90. doi:10.1146/annurev.ecolsys.33.020602.095426. ISSN 1545-2069. ^ Thewissen, J. G. M.; Bajpai, Sunil (December 2001). "Whale Origins as a Poster Child for Macroevolution" (PDF). BioScience. 51 (12): 1037–1049. doi:10.1641/0006-3568(2001)051[1037:WOAAPC]2.0.CO;2. ISSN 0006-3568. Retrieved 16 May 2015. ^ a b Daeschler, Edward B.; Shubin, Neil H.; Jenkins, Farish A., Jr. (6 April 2006). "A Devonian tetrapod-like fish and the evolution of the tetrapod body plan". Nature. 440 (7085): 757–763. Bibcode:2006Natur.440..757D. doi:10.1038/nature04639. ISSN 0028-0836. PMID 16598249. ^ Clack, Jennifer A. (December 2005). "Getting a Leg Up on Land". Scientific American. 293 (6): 100–107. Bibcode:2005SciAm.293f.100C. doi:10.1038/scientificamerican1205-100. ISSN 0036-8733. PMID 16323697. ^ Easton, John (23 October 2008). "Tiktaalik's internal anatomy explains evolutionary shift from water to land". University of Chicago Chronicle. 28 (3). ISSN 1095-1237. Retrieved 19 April 2012. ^ Wilford, John Noble (5 April 2006). "Scientists Call Fish Fossil the 'Missing Link'". The New York Times. Retrieved 17 May 2015. ^ Niedźwiedzki, Grzegorz; Szrek, Piotr; Narkiewicz, Katarzyna; et al. (7 January 2010). "Tetrapod trackways from the early Middle Devonian period of Poland". Nature. 463 (7227): 43–48. Bibcode:2010Natur.463...43N. doi:10.1038/nature08623. ISSN 0028-0836. PMID 20054388. ^ "Four feet in the past: trackways pre-date earliest body fossils". Nature (Editor's summary). 463 (7227). 7 January 2010. ISSN 0028-0836. ^ a b Minard, Anne (9 July 2008). "Odd Fish Find Contradicts Intelligent-Design Argument". National Geographic News. Washington, D.C.: National Geographic Society. Retrieved 17 July 2008. ^ a b Friedman, Matt (10 July 2008). "The evolutionary origin of flatfish asymmetry". Nature. 454 (7201): 209–212. Bibcode:2008Natur.454..209F. doi:10.1038/nature07108. ISSN 0028-0836. PMID 18615083. ^ Gerrienne, Philippe; Meyer-Berthaud, Brigitte; Fairon-Demaret, Muriel; et al. (29 October 2004). "Runcaria, a Middle Devonian Seed Plant Precursor". Science. 306 (5697): 856–858. Bibcode:2004Sci...306..856G. doi:10.1126/science.1102491. ISSN 0036-8075. PMID 15514154. ^ Isaak, Mark, ed. (5 November 2006). "Claim CC200: Transitional fossils". TalkOrigins Archive. Houston, TX: The TalkOrigins Foundation, Inc. Retrieved 30 April 2009. ^ Archibald, J. David (August 2009). "Edward Hitchcock's Pre-Darwinian (1840) 'Tree of Life'" (PDF). Journal of the History of Biology. 42 (3): 561–592. CiteSeerX 10.1.1.688.7842. doi:10.1007/s10739-008-9163-y. ISSN 0022-5010. PMID 20027787. ^ Darwin 1859, Chapter 10. ^ Williams, David B. (September 2011). 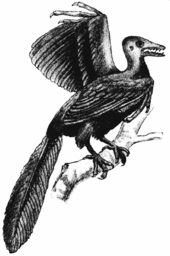 "Benchmarks: September 30, 1861: Archaeopteryx is discovered and described". EARTH. ISSN 1943-345X. Retrieved 24 February 2012. ^ Kidston, Robert; Lang, William Henry (27 February 1917). "XXIV.—On Old Red Sandstone Plants showing Structure, from the Rhynie Chert Bed, Aberdeenshire. Part I. Rhynia Gwynne-Vaughanii, Kidston and Lang". Transactions of the Royal Society of Edinburgh. 51 (3): 761–784. doi:10.1017/S0263593300006805. ISSN 0080-4568. OCLC 704166643. Retrieved 18 May 2015. ^ Kerp, Hans; Trewin, Nigel H.; Hass, Hagen (2003). "New gametophytes from the Early Devonian Rhynie chert". Transactions of the Royal Society of Edinburgh: Earth Sciences. 94 (4): 411–428. doi:10.1017/S026359330000078X. ISSN 0080-4568. ^ Appel, Toby A. (Fall 1980). "Henri De Blainville and the Animal Series: A Nineteenth-Century Chain of Being". Journal of the History of Biology. 13 (2): 291–319. doi:10.1007/BF00125745. ISSN 0022-5010. JSTOR 4330767. ^ Haeckel 2011, p. 216. ^ Bynum, William F. (Summer 1984). "Charles Lyell's Antiquity of Man and its critics". Journal of the History of Biology. 17 (2): 153–187. doi:10.1007/BF00143731. ISSN 0022-5010. JSTOR 4330890. ^ Browne 2003, pp. 130, 218, 515. ^ Sambrani, Nagraj (10 June 2009). "Why the term 'missing links' is inappropriate". Biology Times (Blog). Retrieved 19 May 2015. ^ Benton, Michael J. (March 2001). "Evidence of Evolutionary Transitions". actionbioscience. Washington, D.C.: American Institute of Biological Sciences. Retrieved 29 March 2012. ^ Zimmer, Carl (19 May 2009). "Darwinius: It delivers a pizza, and it lengthens, and it strengthens, and it finds that slipper that's been at large under the chaise lounge [sic] for several weeks..." The Loom (Blog). Waukesha, WI: Kalmbach Publishing. Retrieved 10 September 2011. ^ "Newly found fossils could link to human ancestor". CBC News. Ottawa, Ontario, Canada: Canadian Broadcasting Corporation. 8 April 2010. Retrieved 19 May 2015. It's tempting to call the new species a 'missing link' between earlier species and modern humans, but scientists say the concept no longer applies, given new knowledge of human evolution. [...] Researchers now say the evolution of humans consisted of a number of diverse species in many branches, not a single smooth line from ape-like species to humans. ^ Bates, Gary (December 2006). "That quote!—about the missing transitional fossils". Creation. 29 (1): 12–15. ISSN 0819-1530. Retrieved 6 July 2014. Theunissen, Lionel (24 June 1997). "Patterson Misquoted: A Tale of Two 'Cites'". TalkOrigins Archive. Houston, TX: The TalkOrigins Foundation, Inc. Retrieved 19 May 2015. ^ Gould 1980, p. 189. Benton, Michael J. (1997). Vertebrate Palaeontology (2nd ed.). London: Chapman & Hall. ISBN 978-0-412-73810-4. OCLC 37378512. Browne, Janet (2003) [Originally published 2002]. Charles Darwin: The Power of Place. 2. London: Jonathan Cape. ISBN 978-0-7126-6837-8. OCLC 806284755. Castro, Peter; Huber, Michael E. (2003). Marine Biology. Original art work by William Ober and Claire Garrison (4th ed.). New York: McGraw-Hill. ISBN 978-0-07-029421-9. LCCN 2002190248. OCLC 49259996. Chapleau, François; Amaoka, Kunio (1998). "Flatfishes". In Paxton, John R.; Eschmeyer, William M. (eds.). Encyclopedia of Fishes. Illustrations by David Kirshner (2nd ed.). San Diego, CA: Academic Press. ISBN 978-0-12-547665-2. LCCN 98088228. OCLC 39641701. Donovan, Stephen K.; Paul, Christopher R. C., eds. (1998). The Adequacy of the Fossil Record. Chichester; New York: John Wiley & Sons. ISBN 978-0-471-96988-4. LCCN 98010110. OCLC 38281286. Eldredge, Niles; Gould, Stephen Jay (1972). "Punctuated equilibria: an alternative to phyletic gradualism". In Schopf, Thomas J. M. (ed.). Models in Paleobiology. San Francisco, CA: Freeman, Cooper. ISBN 978-0-87735-325-6. LCCN 72078387. OCLC 572084. Freeman, Scott; Herron, Jon C. (2004). Evolutionary Analysis (3rd ed.). Upper Saddle River, NJ: Pearson Education. ISBN 978-0-13-101859-4. LCCN 2003054833. OCLC 52386174. Leche, V. (1904). "Archæopteryx". In Meijer, Bernhard (ed.). Nordisk familjebok (in Swedish) (New, revised and richly illustrated ed.). Stockholm: Nordisk familjeboks förlags aktiebolag. LCCN 15023737. OCLC 23562281. Swisher, Carl C., III; Curtis, Garniss H.; Lewin, Roger (2001) [Originally published 2000]. Java Man: How Two Geologists Changed Our Understanding of Human Evolution. Chicago, IL: University of Chicago Press. ISBN 978-0-226-78734-3. LCCN 2001037337. OCLC 48066180. Wellnhofer, Peter (2004). "The Plumage of Archaeopteryx: Feathers of a Dinosaur?". In Currie, Philip J.; Koppelhus, Eva B.; Shugar, Martin A.; et al. (eds.). Feathered Dragons: Studies on the Transition from Dinosaurs to Birds. Life of the Past. Bloomington, IN: Indiana University Press. ISBN 978-0-253-34373-4. LCCN 2003019035. OCLC 52942941. Lloyd, Robin (11 February 2009). "Fossils Reveal Truth About Darwin's Theory". LiveScience. Ogden UT: Purch. Retrieved 19 May 2015. Hunt, Kathleen (17 March 1997). "Transitional Vertebrate Fossils FAQ". TalkOrigins Archive. Houston, TX: The TalkOrigins Foundation, Inc. Retrieved 19 May 2015. "Tiktaalik roseae". Chicago, IL: University of Chicago. Retrieved 19 May 2015. "Whales Tohorā". Wellington, New Zealand: Museum of New Zealand Te Papa Tongarewa. Retrieved 19 May 2015. Hutchinson, John R. (22 January 1998). "Are Birds Really Dinosaurs?". DinoBuzz. Berkeley, CA: University of California Museum of Paleontology. Retrieved 19 May 2015.